HÀ NỘI — Việt Nam grabbed three more golds at the Asian Youth Chess Championships’ standard events. The tournament concluded in Thailand on Monday. Bạch Ngọc Thuỳ Dương pocketed her second title after winning in the girls’ U16 category. Women’s FIDE Master Dương ranked fifth before the final round match, with 0.5 points less than her rivals. In the ninth game, while Dương successfully defeated Master Nomindalai Tumurbaatar of India, four players who ranked above her just drew or lost. Dương then jumped to top the category with 6.5 points and clinched the gold due to better parameter. Her first gold was in the blitz chess event on Sunday. The second gold for Việt Nam went to Nguyễn Hà Khánh Linh in the girls’ U10 category. Linh was No 36 seed, but her peak performance pushed her to the podium, with 7.5 points after nine rounds. The third gold was won by Minh Phương in the girls’ U8 category. She also scored 7.5 points. 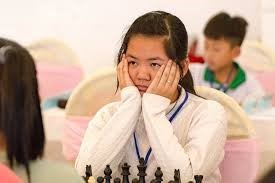 Her teammate Đặng Lê Xuân Hiền was expected to win as she led the ranking after eight rounds. But she fell to the third position after losing the previous match. Vietnamese Masters also claimed two silver and one bronze medals in other events.